The Reichstag (English: Diet of the Realm) was the Lower house of the Weimar Republic's Legislature. It originated in the creation of the Weimar Constitution in 1919. After the end of the Weimar Republic in 1933, the Reichtag continued to operate, albeit sporadically, as the nominal Legislature of Nazi Germany. According to the 1919 Weimar Constitution, the members of the Reichstag were to be elected by general universal suffrage according to the principle of proportional representation. Votes were cast for nationwide party lists. The term of the legislature was four years, however dissolution was common. There was threshold for winning a seat in the Reichstag. In practice, a party could gain parliamentary representation 0.4 percent of the national vote, roughly 60,000 votes. While this provision was intended to reduce wasted votes, it also resulted in a large number of parties being represented in the chamber. Combined with the nationwide party-list system, this made it extremely difficult to form a stable government. Catholic Centrists wanted to create conditions in Germany which would make it easier for the individuals to save their souls; Socialists denied the existence of souls and divided people into classes; the German Nationalists were interested in language and culture; while the National Socialists put the main stress on race. Whereas some looked at pocketbooks, others at the pigmentation of the skin or the index of the skull, fruitful discussions became impossible. When the speaker of one party indulged in his oratory, the others walked out. It was not worthwhile to listen to somebody's opinion when you knew that his premises were all wrong. The grim determination to silence the unconvincible enemy by execution or imprisonment already existed prior to 1933 in many parties. The parliament passed legislation and the government budget, as well as making declarations of war and ratifying international treaties. The members of the German cabinet, or government, were responsible to the Reichstag, which could force the resignation of ministers or even the whole cabinet by a motion of no confidence. It could also revoke "emergency decrees" by the Reich President according to Article 48 of the constitution -—however, on the other hand the President was able to dissolve the Reichstag. In contrast, the Reichsrat, the house of state representatives, had minor significance. The constitution also provided for the possibility of referenda, but the hurdles to overcome were high. There were only two plebiscites (in 1926 on the Expropriation of the Princes and in 1929 on the "Liberty Law" against the Young Plan), which were both unsuccessful. Usually, when a Chancellor was removed from office, his replacement was well short of a majority. This was especially pronounced in the 1930s when the president had to resort to Article 48 just to conduct the ordinary business of government. the use of enabling acts, especially in 1919–1923, and then again the Enabling Act of 1933, after Hitler had been appointed Chancellor, which formed an important building block of his dictatorship. With this latter enabling act, the Reichstag formally gave up its exclusive responsibility for the exercise of the legislative power. 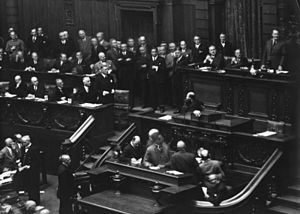 From then on, the German parliament only functioned as a one-party-assembly and as a body which ratified the actions of the Nazi dictatorship by acclamation. Even in its purely ceremonial role, the Third Reich's Reichstag convened only twenty times, the last being on April 26, 1942. On January 25, 1943, five days before the expiration of the last Reichstag's term of office, the summoning of a new body was postponed for another electoral term, until January 30, 1947, by a decree of the Führer. When in 1948–1949 the West German politicians established a new democracy, they used the word Bund (federation) in place of Reich; in German constitutional history, both terms were almost exchangeable. With memories of how the Nazis had exploited the weaknesses of the Reichstag still fresh, the founders of the new state built in several safeguards to prevent a repeat occurrence. The new parliament became the Bundestag, elected by mixed-member proportional representation—a mix of members elected from individual constituencies and state party lists. From 1949, to qualify for seats by proportional representation, a party must either win at least five percent of the national vote or else win three directly elected seats. The Chancellor (Bundeskanzler) must be elected by an absolute majority in the Bundestag, and could only be removed from office if a prospective successor was already assured of a majority. Besides the Bundestag, the Bundesrat (representing the governments of the states) has a decisive vote on legislation where the states' interests are concerned. After the German unification of 1870, the new Reichstag first met in the houses of the Prussian Landtag in Berlin. In 1871 it decided to have a new building constructed, and in the meantime had its base in a former porcelain factory at number 4, Leipziger Straße. Some 23 years later the Reichstag's new building was finished, and it was opened by the Emperor in 1894. This is today known as the Reichstagsgebäude or as the Reichstag. After the building was severely damaged in the Reichstag fire of February 1933, the Nazi Reichstag met in the nearby Kroll Opera House. Towards the end of the war the surviving, but heavily damaged Reichstag building was the object of numerous Soviet attacks because it was seen as a symbol of the Third Reich. They hoisted the Red Flag just in time for the Mayday celebrations of 1945. After the war, it was repaired and used as an exhibition hall, but major renovation and rebuilding were needed for the new German Bundestag. Since 1999 the German Bundestag has used the former Reichstag as its permanent building. Its official address is Platz der Republik 1. Wikimedia Commons has media related to Reichstag (Weimar Republic). Complete collection of records of the Reichstag from 1919– 1942 at the Bavarian State Library. In German.